I have a confession to make, I am a member of a lot of mommy groups on Facebook. I have probably exceeded the recommended number of groups one should be a member of and I won’t tell you just how many I belong to — trust me, it’s a lot. As you imagine a bunch of moms in groups on Facebook talk about their kids a lot. I like this part of the groups because I value the input other mothers bring to my questions. I prefer to talk to typically like-minded moms who may have already had the same question, experience, concern or issue I have had. It is part of my village. In today’s world the village that once existed in our neighborhoods now exists online, but that’s another post entirely. In little mommy enclaves all over Facebook there is one statement that drives me insane. One antiquated mindset that just will not die. Day after day, post after post women are driven to anxiety and sometimes tears by these three words, “My pediatrician said…”. It has to be said that I like my pediatrician just fine. This isn’t some I know more than my doctor about ear infections or chicken pox post. I like doctors, I am not trying to say we don’t need doctors, because at one point or another we all do. But when it comes to breastfeeding, baby food and sleep I don’t think my pediatrician has all the answers. Maybe yours does. Maybe your pediatrician has done a lot of continuing education and is not afraid of not night weaning or you trying baby led weaning. But they probably have not read up on these things and would like you to give your baby rice cereal at four months or just feed them pureed foods have you introduce cow milk early or they think your baby is small. Regardless of their sometimes out of date advice moms are running to Facebook groups desperate for input from others who have been there. Someone to tell them they haven’t scarred their kid for life or worse. So my real issue lies in the fact that in 2015 with the abundance of information, the village of parents available at your fingertips and the simple fact that no one knows your baby like you do, we are still so reliant on the word of someone who got a degree some thing like thirty years ago! When did we become our parents? When did we go back in time and begin to think that only doctors and other medical professionals know what our children need more than we do? Or that their ‘expertise’ should go unquestioned because there is a diploma on the wall? 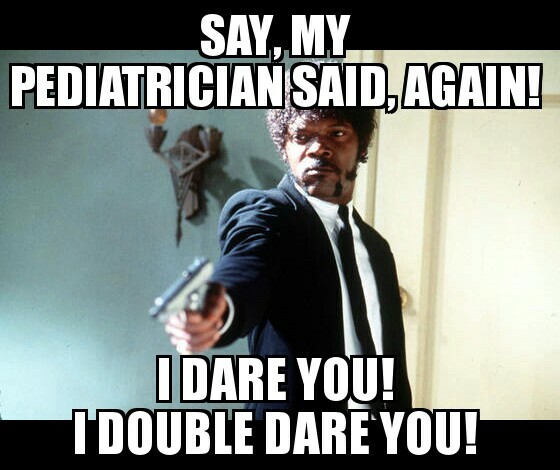 I am so frustrated by recent articles like a few from the NY Times dishing out terrible parenting advice on the backs of, “my pediatrician said”. From the question of sleep training to what to feed baby and when, we are reduced back to our childhood selves as we sit in those brightly colored rooms waiting for the man (or woman) with the coat to come in with their diagnosis or expert opinion on the little human we have been caring for 24/7 since birth. Help me think here people! How do we help each other build back our confidence as parents? How can we help one another understand that we actually know our children better than the staff that sees them once every few months at well visits? We have to be able to get to a place where the words, “my pediatrician says” no longer strike fear and a sense of inadequacy into the depths of our souls. Can we look at each other compassionately and understand that our choices are made from a good place? We don’t all take the same route or use the same methods but we should know we are all we have in this club of parenting. If we continue to let ourselves be divided by the experts around us and labeled by the following or not following of their advice we are only separating ourselves from the people who can truly empathize and help us. I get it, information comes at us from all directions and it is hard, at times, to decipher good advice from bad. But that is no reason to take advice from the guy in the coat just because he’s wearing a coat.